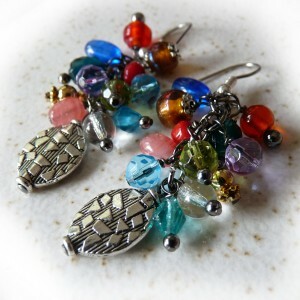 I’d like to welcome our newest content contributor to WireJewelry.com – Rhonda Chase. We have featured Rhonda here on our blog before, but we are happy she will now join us as a regular! 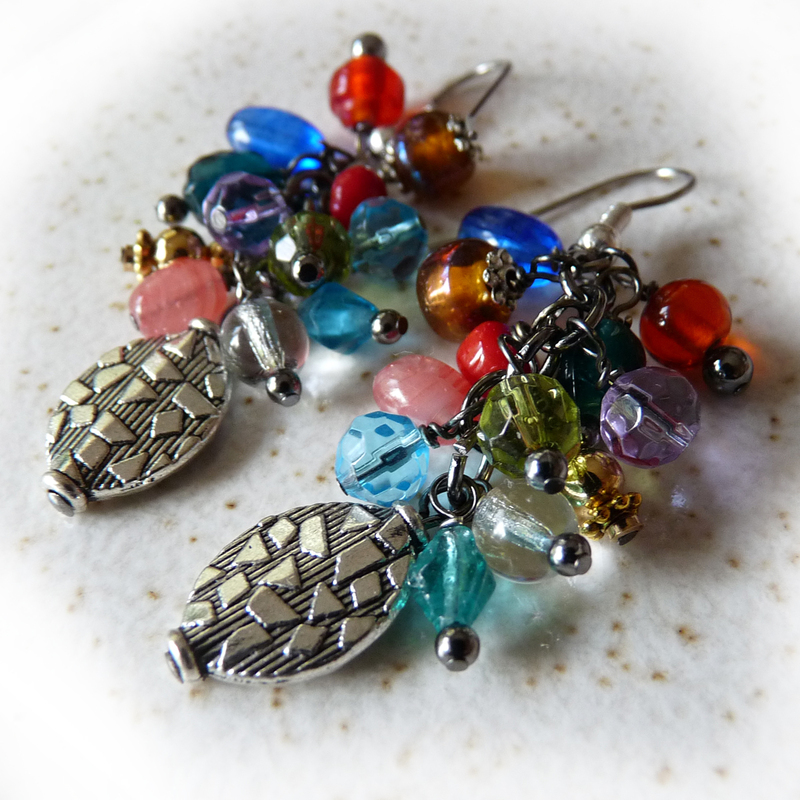 Rhonda Chase is an award-winning jewelry artist who began her career as a graphic designer. For many years, she owned a successful design and marketing firm in the San Francisco Bay Area, serving large corporate clients. In 2009 Rhonda decided get her hands away from her computer and back into the art she loves. She focused on jewelry design and quickly gained recognition the field: winning awards and showing her work in galleries. 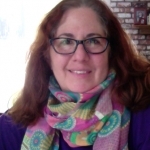 She has been writing tutorials and teaching art classes in various disciplines for over 20 years. Rhonda has taught jewelry making classes for our sister company JewelryTools.com at the JOGS Gem Show in Tucson. Today Rhonda shares a simple pattern with us called: Beaded Cluster Earrings. 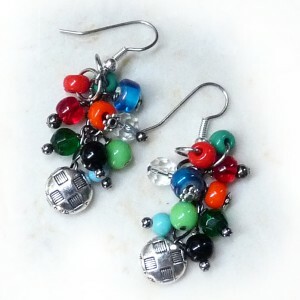 There are many ways to make popular cluster dangle earrings like these. The directions I see most often are for attaching beads to a chain with jump rings. However, my favorite way to make these great earrings is a little more laborious, but it gives you more control, a sturdier earring and often a fuller look. 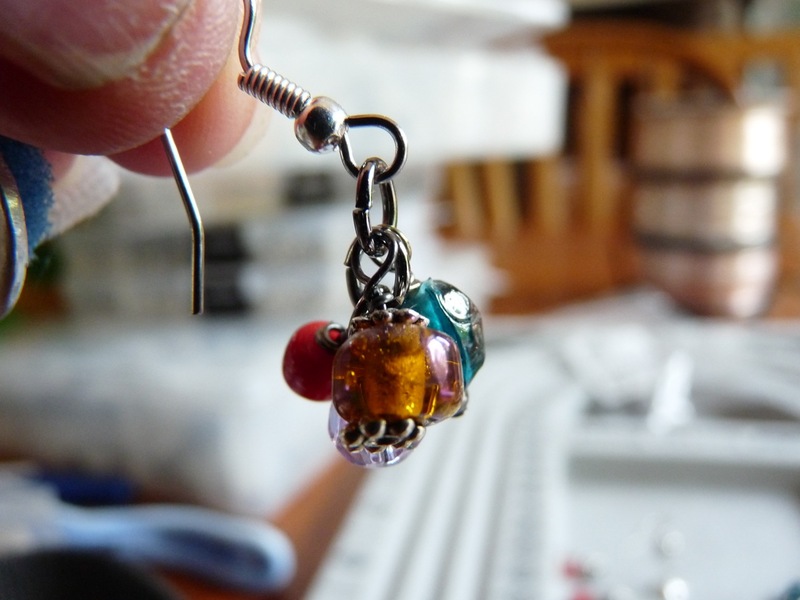 In this tutorial, I’ll show you how to make your own dangles and build your own dangle chain for the earring base. This is also an ideal project to practice making wrapped loops and end up with awesome earrings. I hope you enjoy it! 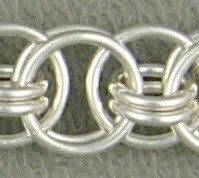 An even number of small beads (20-30). If the holes are bigger than the headpins, you’ll also need the same number of seed beads. Step 1: String a bead (with optional seed beads) onto a headpin. 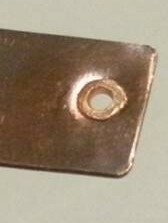 Leave at least a 1/2″ un-beaded “tail”. 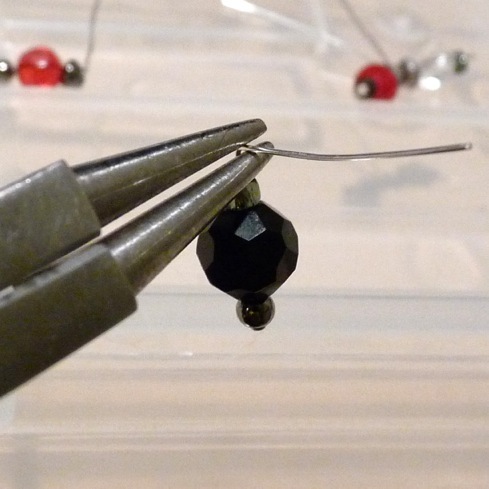 Step 2: Bend the tail of the headpin at a right angle, 2 – 4mm above the top of the beads(s) with flat nose pliers. Step 3: With round nose pliers, hold the wire tail at the bend and loop the wire tail over the pliers and into a circle with your fingers. 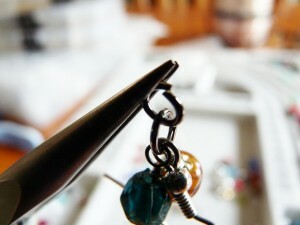 Step 4: Then wrap the remaining wire tail around the headpin in the space left above the beads. Make at least 1 full wrap. You can wrap as many times as you want after that, if the wire is long enough. 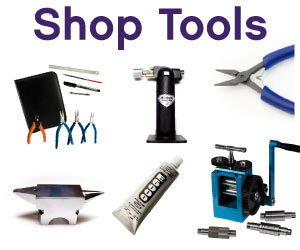 Use pliers to add stability. 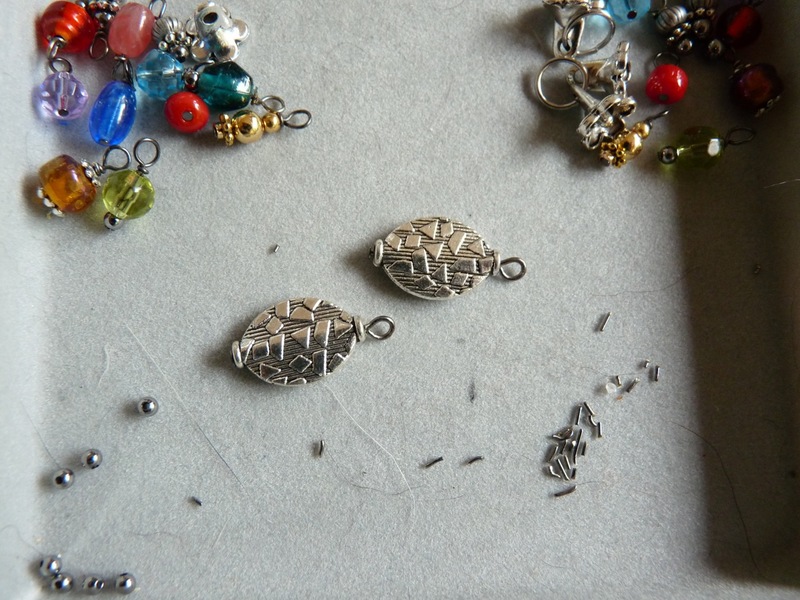 Step 5: Cut excess wire close to the wraps. Step 1: Repeat. Repeat. Repeat. 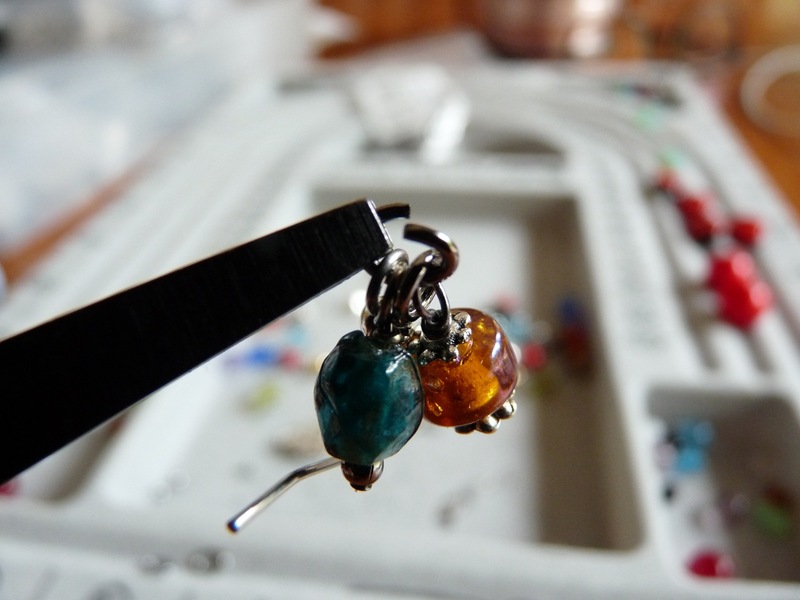 Keep making dangles with the small beads until you have two (matched) sets of at least 5 – 10 beads each. 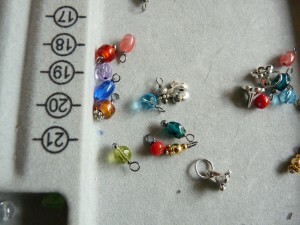 I used 12 dangles for each earring for a total of 24 small bead dangles. 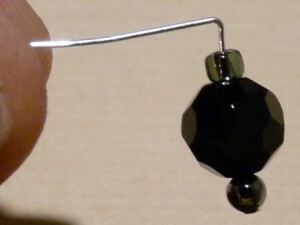 Step 1: Make dangles with your large beads. You’ll only need two. 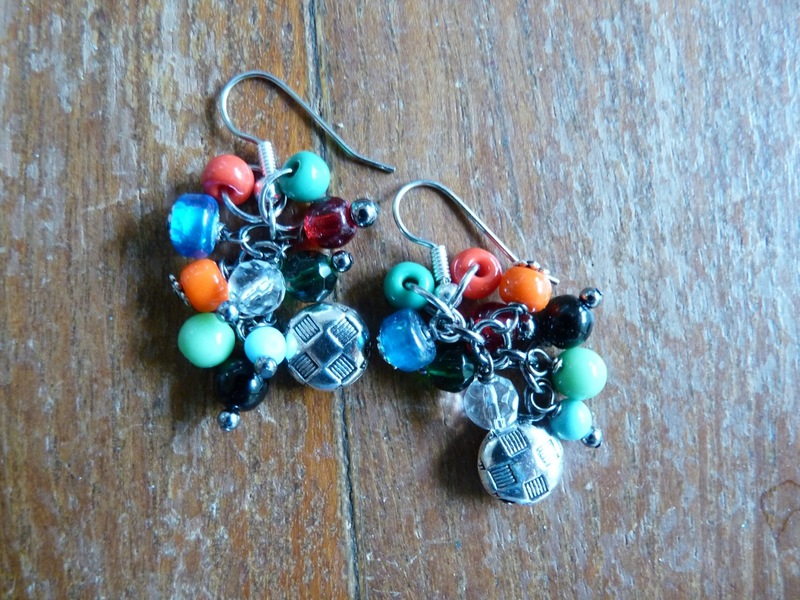 These will hang at the bottom of your earrings. 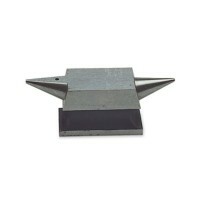 Step 1: Open 1 jump ring with pliers. 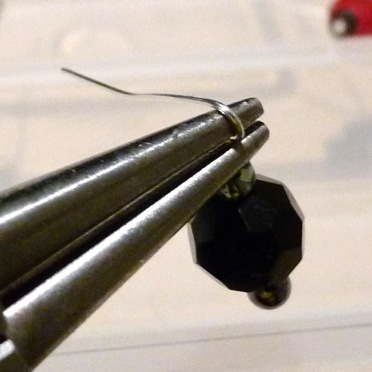 Step 2: Slide the jump ring on one ear wire. 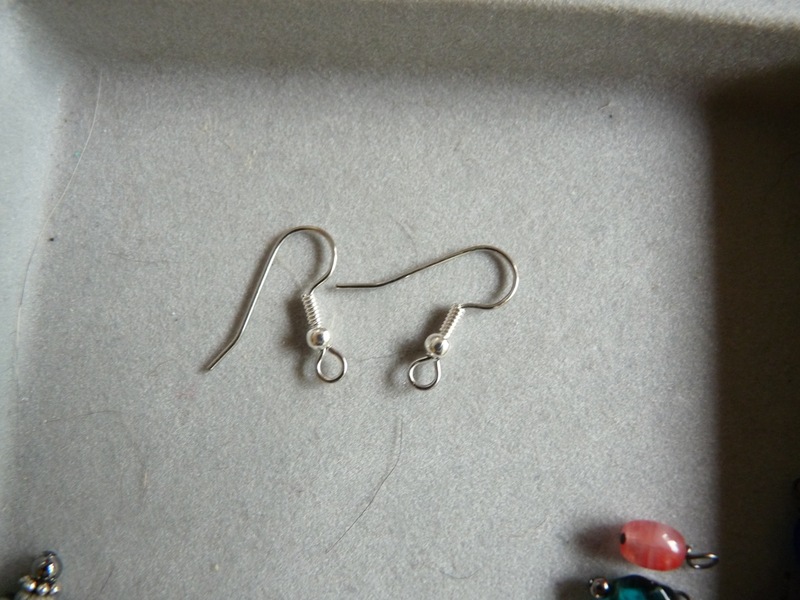 Step 3: Add 1 dangle to each side of the ear wire and close the jump ring. 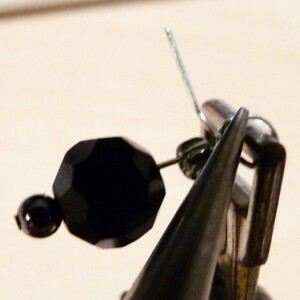 Step 4: Set the grouping down in this configuration and repeat with the other ear wire. Step 1: Open a second jump ring. 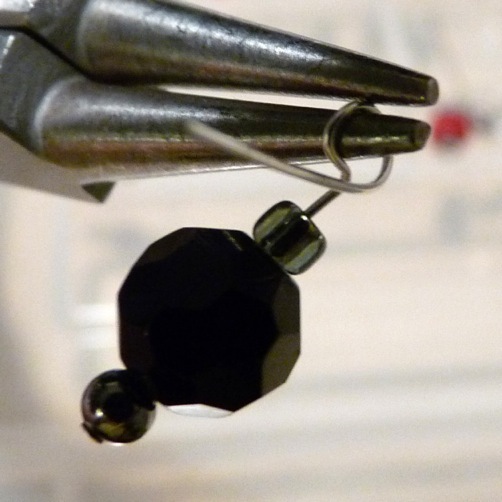 Step 2: Add it to the first ring, making sure you keep the configuration from the previous step. Step 3: Add a dangle so they fall to each side of the open jump ring. Step 4: Close the jump ring. You will build a chain of dangles in this way until you like the look and the length. Continue until you’ve attached all your dangles. Repeat with the other earring (in bead order if possible). HINT: It helps to work upside down, but hold your earrings right-side-up once in a while to see how they look. Remember to make sure your dangles fall to each side of the jump ring when you pick up the cluster. 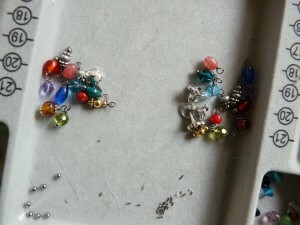 Step 1: Before you close the last jump ring on each earring, add the dangle with the large bead. Step 2: Close the jump ring and hold your earring by the ear wire to see how it looks. Do the other one and you’re done! 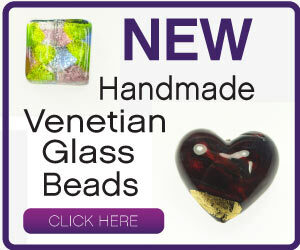 If you’d like to see more from Rhonda you can see her blog posts HERE!